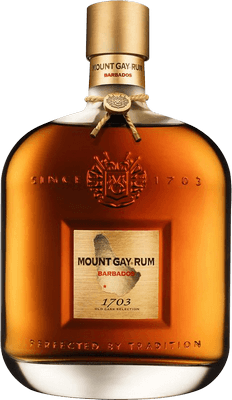 Have you found an online vendor selling Mount Gay 1703 Old Cask? 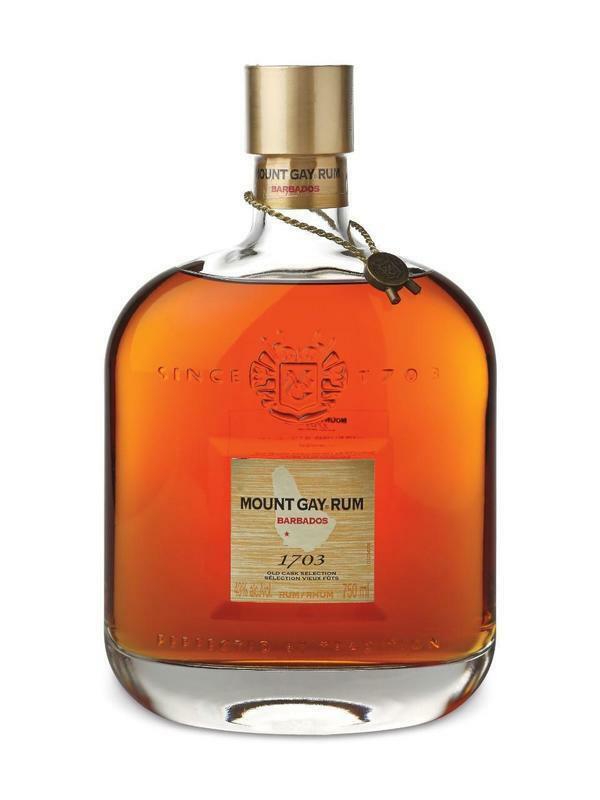 Mount Gay 1703 rum includes rums aged between 10 and 30 years that are joined by master distiller Allen Smith. Mount Gay Distilleries is the oldest operating distillery in the Americas - producing rum in Barbados since 1703, hence the rum's name. 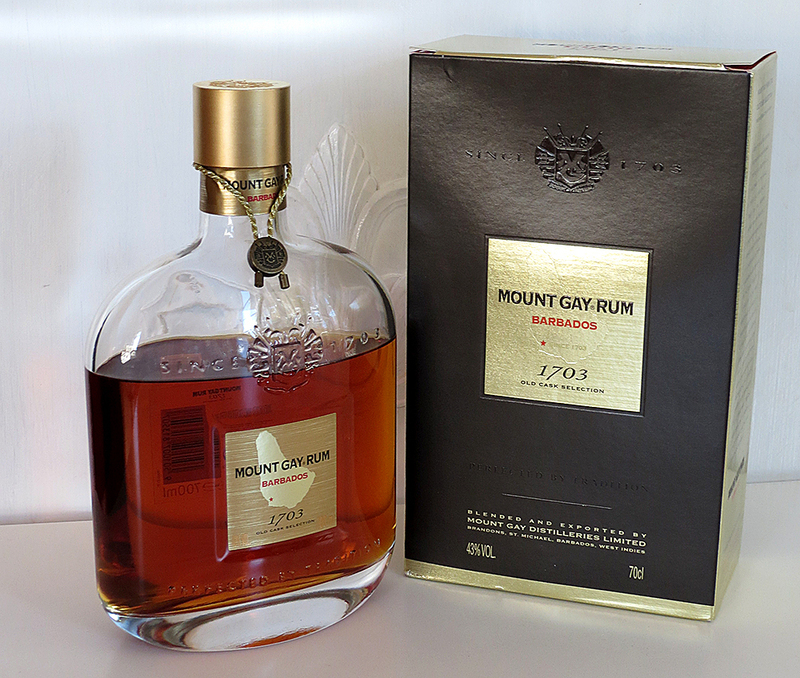 It's original name was Mount Gilboa, and in 1801 renamed Mount Gay after the distillery's manager Sir John Gay Alleyne. The aroma in the bottle is nice...very nice. I can't really describe it but it is a positive sign. Upon sipping I detect a spicy oak (but very little of the bitterness that sometimes come with oak aging) along with a slight hint of sugar cane sweetness which becomes more apparent in the finish. Not a harsh burn but a pleasant enveloping warmth that flows down the throat before fading. Definitely a sipping rum. Chewy molasses, rich butterscotch, fragrant toffee, a light touch of vanilla and cocoa - this rum has it all. I read an interview with RL Seale, (the Foursquare guy), who said that most rum drinkers think they like sweet rum but what they really like is sweetened rum. No doubt he'd add that if drinkers gave a pure, un-sugared rum like this one (and his own superb Foursquare rums) a chance they'd appreciate the immense pleasure from all that they have to offer. They are naturally sweet, and so much more. I found a bottle for US $85, a steal after shelling out $160 for Flor de Cana 25. Both are mighty tasty, but the 1703 is a treasure. Straight up, right? A nice looking bottle that comes in a cheap paperbox (picture). When you first smell the rum you find it a bit sticky but when it rests for a few minutes you get a nice smell of fruit, honey and oak. The taste is a bit sweet with vanilla, oak and spice. You also sense some oak and spice on the quite long aftertaste. I think this rum nice but a bit overpriced. Taste profile similar to Mount Gay XO but almost triple the price. Prefer Abuelo Centuria at this price point. More richness, leather and wood than Extra Old, but pricy. For slow sipping. So I have bench marked this against plantation 20 year old XO. Not as smooth as if you are a lover of whisky. Has a slightly medical taste and not the smooth sweet molasses taste of a rum. Among my absolute favorite Barbadian rum. Rumor has it that it's a blend of rum between 10 and 30 years. The nose is full and interesting with oak, leather, tobacco, coconut, subtle butterscotch and something slightly acidic and sweet, reminding me of juicy pears. Fantastic. The taste is exceptional and to me balanced perfectly. It's full bodied, initially with ripe pears and a subtle hint of butterscotch sweetness quickly fading into refined notes of vanilla stained oak and tobacco. The finish lingers for a long time. World class rum worth every penny. I simply feel that skillfully aged and unsweetened rum like this, offer a delicate taste profile, that non of the additive rums can hope to achieve. Beautiful and flirting with a 10. This is a decent rum, but for my taste the bourbon barrel aging seems to overpower the rum flavor a little more than I like. Smells and tastes of bourbon, oak, caramel, with just a touch of vanilla. Pretty smooth, and if you like bourbon aging, you might enjoy this even more than I did. My first try in the Mount Gay and the 1703 Old Cask was clearly a good catch ! Dry but not to much , this MG is well bodied but still easy to sip with a large bunch of aromas like oak and caramel. Really a nice dicovery from last tasting ! My experience with this rum is different from most. I've had a bottle in my cabinet for several years, and the bottle is still almost full. Giving it another try tonight, I get strong alcohol on the nose, with some burnt caramel behind it. It's smooth, only a little heat. I can detect some roasted nuts with the oak and the caramel. But on the whole, it doesn't do much for me. Everyone's palate is different. Not a bad rum, it's just not for me. I bought this rum because I liked the XO so much. The bottle and cork pledge premium but it somehow lacks the well balanced flavors that make the XO great. This is an incredibly smooth rum with a beautiful finish. The longer aging really brings out the flavors of the casks with great hints of vanilla and fruit touching the pallet. One of my favorites but there are better rums for less money. Not sugared. The sweet is is is the age. So the flavors are long lasting and the finish is fat. Others tasting notes describe the profile. I respect it like a fine wine, well made and worth taking time to enjoy. So far have had only neat with no ice. For me I will share only with my friends. slight smell of apples and pear similar to Pyrat Cask 1623, but more harsh. The taste is not nearly as smooth or complex as I would have imagined for such a premium/expensive rum. In a side by side with ED 21, the 21 was easily better in all aspects. 80+? Definitely a quality product and I am not upset that I bought it. But I am glad I caught my bottle on sale at half price. I mainly bought it due to the sale, I am a Bourbon/Rum drinker by trade and I thought the bottle looked cool. Honestly, its good as far as being smooth and very drinkable but no real wow factor in this one... it's just a solid, I asume unsweetened from the taste, rum and I can certainly appreciate the reserved sweetness of this rum. It may be too dry for the average rum drinker who looks for a more intense sweetness. I'll certainly finish my bottle and enjoy it but there a simply better options out there for my tastes. Glad I tried it but I never need another bottle and this has almost put me off blindly buying bottles (but I did blind buy Foursquare Triptych and that was a HOMERUN!!!). Ultimately, Mount Gay products simply never seem to meet my expectations... of course, to each their own. I find that some distillers just capture flavor profiles that are very appealing to me across their entire line. What I like may not be what you like so please give it a go! You know, what are you drinking. Nice, smooth, easy, soft, not much of sweet taste. Old classic for me. I can highly recommend! Le nez de ce rhum est très doux, très agréable, à la fois beurré et épicé, caramélisé et boisé. Tout est très équilibré, c’est la délicatesse qui règne ici, sans outrance mais sans timidité non plus. Le rhum déroule lentement ses arômes : de la coco bien grasse, un côté végétal un peu médicinal et résineux. Tout se fait par touches, sans brusquer, avec assurance et sérénité. Les épices sont douces, fondues, mais bien présentes cependant. Quelle maîtrise ! L’aération va aller chercher des arômes plus corsés. Comme après une averse, les odeurs de bois mouillé laissent place à d’autres plus musquées. Le rhum prend alors une autre tournure : voici du cuir frais, de poivre et du piment. Alors qu’il s’était montré soyeux jusqu’ici, il dévoile un caractère plus puissant mais toujours très juste, à l’image de fruits coque frais et finement moulus. Il manquait un versant végétal, c’est maintenant chose faite, et nous avons aussi un petit vernis qui se fait le messager d’un joli boisé. L’équilibre et la maîtrise de ce rhum sont vraiment saisissants. L’entrée en bouche ne déçoit pas, nous avons une belle attaque, mesurée, avec du boisé et de la levure. Cette bouche est très savoureuse et équilibrée, tous les arômes s’entremêlent mais on distingue de la cire d’abeille et du thé, ainsi qu’une sensation briochée et une vraie notion de complexité. La texture est fondante et le boisé est classieux, c’est un très joli rhum. La finale offre une consistance très juste, ni trop fine ni trop épaisse, elle rassemble toutes les saveurs rencontrées lors de la dégustation en une nouvelle saveur plutôt délicieuse. Sweet, oaky and fruity, lots of vanilla sweetness and faint hints of smoke. Je dobry, ostrejsi. Zkousim tuto aplikaci. Moc to nefunguje. For the price, definitely a special occasion rum. It follows the same flavor profile as the XO (of course). It has a taste that is a little sweet with vanilla, spicy pepper and oak. Long after taste. This was the first rum in English style that I tested and maybe my rate is unfair because of that. Today is the English style my bag, but at that time I was more into the Spanish style and I didn’t like Mount Gay at all. There are much better rums in and below the price range of this. It was just too subtle in the nose, mouth and finish. Hey but that's just me, I like a bit more robust flavors.